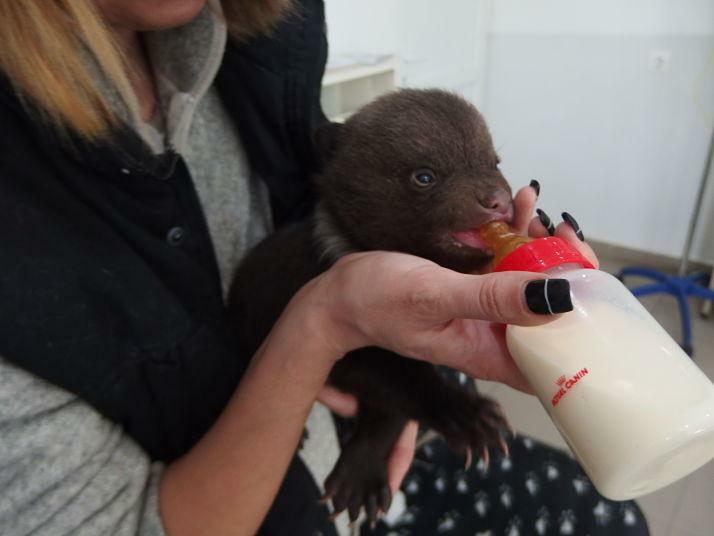 Forest rangers discovered two bear cubs, about one month old, without their mother, in the Pădurea Bogății forest reserve, around 50 km north of Brasov in central Transylvania. The rangers had been observing the babies, in their den, for three days, hoping their mother would return. As the mother bear didn’t show up, the rangers called the AMP to ask for help. The mother had been shot and killed by a hunter. This is against the law in Romania because only the males should be shot. 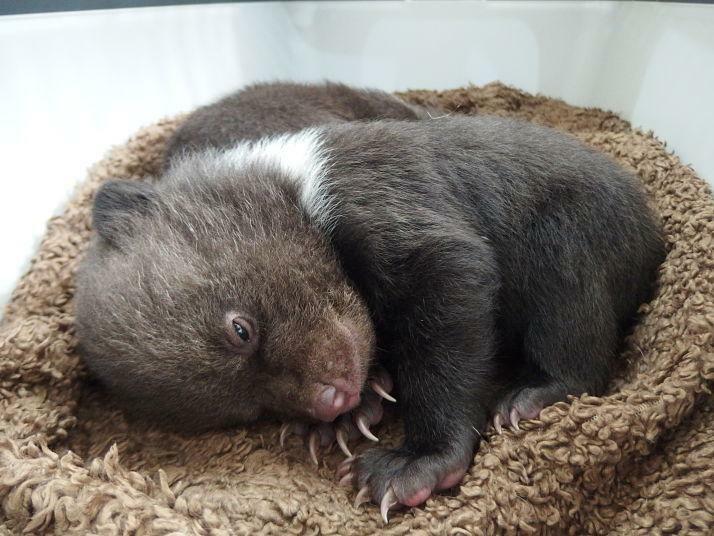 The AMP team went there and took the baby bears to the Victory animal shelter. After the first medical inspection the cubs seem to be healthy but a little bit dehydrated. The cubs will be transferred to the Libearty bear sanctuary, in a quarantine area where only the caretaker will have access. The babies will be bottle-fed every two hours, as they need special milk. In the forest, the mother bear can breast feed her cubs for up to two years, so time will show us if they will make it or not. They are weakened and so the risk of getting sick is quite high. If the babies will be strong enough to survive, the AMP specialists will assess their chances to return to the forest. EcoHustler interviewed Cristina Lapis - founder of the Libearty Bear Sanctuary Why did this happen? Why did somebody shoot the mother? This is a very difficult question! Why do people kill each other? Why are human beings more cruel than all the other animals? Why do people say that animals have no soul and no intelligence! We found the two babies crying of hunger. For me, this sort of hunting is the same as murder. The hunters may be more rich, better dressed and have an authorisation to kill, but, for me, the act is the same. What will happen to the cubs now? These two cubs, were lucky, they are safe, but how many others die every year, frozen, alone, screaming for their mother killed and nobody hear them, or they are captured and sold as pets?! The two boys will stay with us until they gain some strength. They were dehydrated, and week, very young, 3 weeks maybe and they need a lot of care! Every two hours they are fed with a special preparation. And if we succeed to put them on their legs I wish for them to be released back into the forest where they belong. It will be very painful, because I know that sooner or later, they could be shot like their mother but even if my sanctuary is a “five stars” place for bears and “all inclusive” there is also an electric fence which remember to the bears that they lost forever their liberty! Are attitudes changing to hunting bears? Studying human beings for the twenty years I have given of my life to save animals I have learnt that even the worst human being has a heart. However, sometimes, the childhood, education and life lead some people to deny their feelings of compassion. If all the mothers of the world would gather a voice to explain what it is like to give birth, to carry a being in her body, and what a pain it is that somebody kills this little soul, maybe this would stop the senseless killing of wild animals? People would no more take the veal from the cow to eat him! But this is the lost paradise that some of us dream trying here and there to repair the damages, a drop of hope in an ocean of suffering! Every year we have one or 2 cubs who lost their mother. We do what we can and a big project is the program of education schools to change the minds and to open the hearts before they shut forever! I send you the last pictures of the babies... Who could believe that behind their little round eyes isn’t a soul? How can we help? No matter how big or small, all donations help us to care for the animals. And come and pay us a visit! Romania has stunning scenery and wildlife and of course... bears!